The addition of wise-guy narration, a goofy tone, and juvenile humor (sometimes the scatological sort) turns this animated feature into something only small children will enjoy. And that’s a shame, given how accomplished the CGI work is. Gradations of color within dinosaur skins really give them a believable complexity, and representations of fire and water are every bit as accomplished as what we get from Disney. 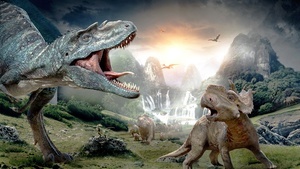 BBC Earth cranked it up a notch in producing dinosaurs that look real as can be and move even more fluidly than they did in the TV series. The mammals and birds aren’t as accomplished—more animatronic looking, really—but they don’t surface in the narrative that often. I wish I could say the same about dumb writing. What BBC Earth originally proposed would have worked much better: using the kind of voiceover that Disney gave its True Life Adventures. Those animals didn’t talk, but they were still given personality by the voiceover and the character-storyline approach to nature films. Set in the Cretaceous period, Walking with Dinosaurs tells the story of Patchi (Justin Long), the inquisitive runt of a group of Pachyrhinosaurus hatchlings whose life begins with a close call—being carried off by a predator. Despite being rescued, he carries the scar—a hole in his frill—that will enable us to tell him from the rest of the herd. Had we gotten the same kind of voiceover as the popular TV production, I don’t think too many people would have complained about how similar the plot was to Disney’s Dinosaur. But when you add goofy gags and voices and clumsily insert lessons on dinosaurs, you draw attention to the fact that, as in Dinosaur, you have a dinosaur hero we meet at birth who’s considered weak, at first, who finds a love interest that’s broken up when the leader of the herd forces her to go with him, then the group is threatened by meat-eaters, and the hero manages to come to the rescue of the herd after the leader makes a huge miscalculation. The plot isn’t identical, but there are enough crossover points to make it less fresh than it might have seemed had our focus been more on the incredible animation. 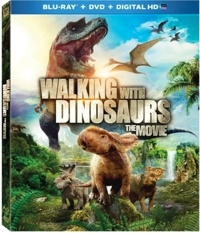 Though it may trod familiar ground, Walking with Dinosaurs is actually an entertaining film IF you can look past the ridiculous running commentary from the bird narrator (John Leguizamo). But it takes a lot of concentration to be able to do that—or else you have to be young enough to be in synch with the humor, because basically Fox took a concept with wide appeal and reduced it to children’s fare.